If you're hoping to spot some wildlife in Ethiopia you won't see anything more awe-inspiring than a a close encounter with a hippopotamus. And you won't find anywhere more comfortable to spot them from than our restaurant while enjoying a sundowner! 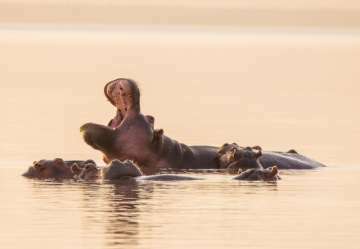 At Hara Langano Lodge we carefully manage 300m of the lake shore including 2 hectares of smooth swamp land with their favourite grass to encourage the local hippos to take residence. We removed tree roots, debris and scrub woodland in order to protect their feet, and cut down the taller reeds to create new shoots that the young hippos love. We maintain the area around the lodge to ensure that the hippos stay here and are protected. The area is close enough to easily watch the hippos, and far enough away to not interrupt their daily routine or disturb them. A small pod of around ten animals, consisting of a bull, several females and a couple of young spend most of their time just 150m away from the lodge, well outside their 100m personal zone. A big increase from the couple of individuals who used to be present here. It's thought that a handful of hippos walked down the river from Ziway about 50 years ago. Each night from around sunset until dawn these majestic creatures leave the cool, still waters of Lake Langano, along the hippo runs they have created. We reintroduced their favourite grass along the lakeside and keep it trimmed to the level they prefer as well as removing scrub woodland. All of this ensures that this is the place where they will graze at night, in full view of our facilities and several verandahs. 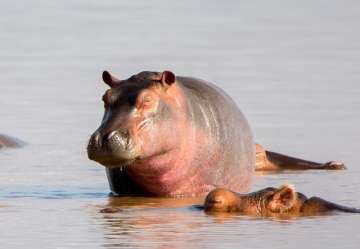 The hippos are used to people in the lodge and as long as people are respectful of keeping a reasonable distance they will not interfere with the lodge or its guests. 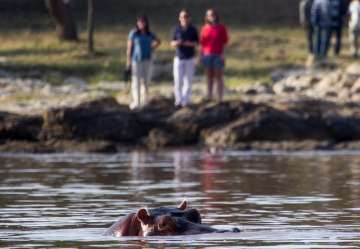 The guides at the lodge carefully monitor the hippos and their environment and watch out for any outside interference. We haven't named them all yet as we're still working out how to recognise them – not easy when you only see their eyes most of the time! If you would like to watch hippos in Ethiopia, you couldn't hope to find a better spot than the Hara Langano Lodge.